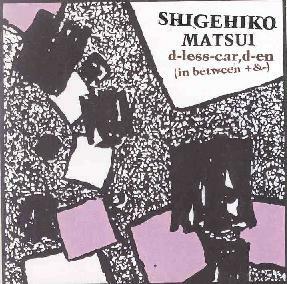 Shigehiko Matsui - "d-less-car, d-en (in between +&)"
Now here's a seriously fun electronic album. Or at least that's what it mostly is. The set opens with "Oboretpanashi", a lo-fi acoustic guitar, harmonica and vocals tune embellished by bubbly efx that increase in volume, freakiness and madness as the song progresses. Neil Young for the avant-garde. But what "d-less-car, d-en (in between +&)" consists mostly of is totally freaked out alien electronics that will make you feel like you're in some surreal morphing of Pacman, Space Invaders and Asteroids. As "Oboretpanashi" ended I was completely unprepared for "Edger", a playfully tripped out piece that combines electro sounds and tones with more aggressive noise patterns and spaced out cosmic waves. Each part is very basic but bringing the elements together makes for a video game inspired roller coaster ride. Matsui sometimes adds rhythm to the mix, and though there's a virtual meteor shower of alien activity it can have a definite toe tapping robotic groove. And the fun is only beginning. Throughout the set we find ourselves in the most chaotic sectors of the galaxy with space debris pummeling our craft as we fight to make our way through the electronic onslaught. It's like Forbidden Planet's battle with the id taken to frenzied heights. But scattered throughout are a few more songs, though they are far more crazed and loaded with efx than the opening track. They are extremely strange (by no means a bad thing) and the one that I enjoyed most had to be the lo-fi space electro punk tune "Bounds Going On", which conjured up images of Bob Dylan fronting Devo. (Can you picture that?!!!). Overall a fun as hell set of spaced out pandemonium which should be enjoyed by hyperactive electronic fans.